What they don't know, however, is that he has a superhero alter ego, namely, the Green Ninja. In that capacity, he serves as the leader of the Secret Ninja Force, a team of five teens and an android under the tutelage of Lloyd's wise and wisecracking uncle, Master Wu (Jackie Chan). In lieu of weapons, he's trained each of his proteges to harness a different force of nature contained in his magical treasure chest. The hot-headed Red Ninja (Michael Pena) controls fire. The music-loving Black Ninja (Fred Armisen) has mastered earth; the Blue Ninja (Kumail Nanjiani), lightning; and the Gray Ninja (Abbi Jacobson), water; while the robotic White Ninja's (Zach Woods) domain is ice. Their appointed mission is to prevent Lord Garmadon (Justin Theroux) from conquering Ninjago City. Complicating matters is the fact that the evil villain also happens to be Lloyd's long-lost father. He abandoned his wife (Olivia Munn) and baby when she resisted his embrace of the dark side. So, all the boy knows about his dad is the little he's been told by his mother and uncle. Consequently, Lloyd is as eager to meet as to defeat the diabolical warlord with the well-earned reputation as the world's "Worst Guy Ever." If you've seen either LEGO or LEGO Batman, then you have a decent idea of what to expect from the third installment of the inspired, animated franchise. Directed by Charlie Bean, the frenetically-paced, action film features not only another visually-captivating adventure, but more of the pithy asides and clever allusions to screen classics which make the movie interesting to adults not necessarily in the target demo. Ninjago ultimately proves to be the best episode yet because of the profusion of positive messages delivered by the picture's end. An alternately high-octane, hilarious and heartwarming treat that's hard to beat! 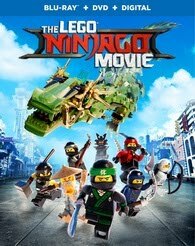 LEGO Sets in Action; The LEGO NINJAGO Movie: Ninja Formation; Find Your Inner Ninja with Jackie Chan; Ninja Jokes with Jackie Chan; Kicks & Bricks: Making The LEGO NINJAGO Movie; The LEGO Ninjago Movie: Back to School; Me and My Minifig; and commentary by director Charlie Bean and crew.